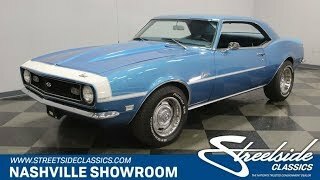 Hi, I am interested in your 1968 Chevrolet Camaro (stock #1298-NSH) listed on Autotrader for $34,995. I'd like to get more information about this vehicle and confirm its availability. What we have here is a sweet looking 68 coupe that is the perfect combination of originality where it matters with a few nice upgrades for a bit of extra performance. It starts with a very desirable, numbers matching 327 that sets the bar pretty high to begin with, which is backed up by paint and interior that has been kept in the factory original colors. Check it out. Lemans Blue is a gorgeous color that really shows off the beautiful shape of this car. It catches the light and reflects it back along the gentle curves of the front end and especially highlights the muscular bulges of the rear fenders where the roof blends into them. A White hockey stick stripe leads the way up front and runs down the front fenders with Camaro in script just above it, tapering off as it ends on the doors. Up front, the grill is simple in black, trimmed in chrome, with an SS badge in the center and is flanked by single headlights on each side. A cowl induction hood flows up and back from there and a thin chrome bumper underlines the grill nicely. Chrome dresses out the fender wells and the rocker panels too, while out back there is a spoiler on the trunk lid, an SS fuel filler cap between rectangular taillights, and another sharp looking chrome bumper underlining everything. Open the door and you will find a Blue Custom interior that is also the original color this car was delivered in, and matches the Lemans Blue paint quite nicely. The molded door panel has a long armrest which is comfortable for long distance cruising and a slash of chrome underlines the door pull as well as Camaro in script. A deep dish, 3-spoke steering wheel sits in front of a stock dash with the speedometer and engine gauges protected from glare by being tucked deeply back in their pods. The center of the dash has a nice wood tone treatment which is trimmed in chrome and houses the ventilation controls as well as a JVC FM/CD player for your listening pleasure. The center console is also trimmed in wood and there is a horseshoe shifter for the automatic transmission as well as a little storage compartment in it. The bucket seats are comfortable with pleated seating surfaces and smooth side bolsters for support. Pop the hood and you will find one of the very desirable 327 cubic inch motors nestled down in a neat and clean engine bay. It is the original engine in this car with matching numbers which makes it even more precious and there have been some bolt-on upgrades added for improved performance. A chrome air cleaner assembly gathers up plenty of fresh air from the cowl induction hood and feeds it to an Edelbrock carburetor and intake manifold. The valve covers as well as the alternator, water pump and brackets have all been chromed adding some flash to the motor and the hoses are dressed up in brushed metal protective covers with chrome ends. Long tube headers get the spent gasses out and everything adds up to a motor that runs great and sounds strong. The rubber meets the road through 25560R15 tires in the back and 235/60R15s up front mounted on Rally wheels with chrome centers and trim rings. This car is a looker and a runner with an original, numbers matching 327 presented in its original color paint and interior. Come on down and check it out for yourself. You just might decide that it is just the 68 you have been looking for.